Thanks to the support of local residents, the Sleep Cheap Charities Reap promotion has topped the $1 Million mark. This year’s event raised $175,988 to put the eight year total over $1 million. 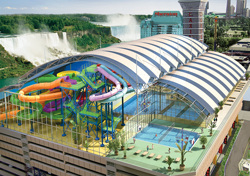 The annual fall fundraiser offers hotel stays and waterpark packages at steep discounts to Niagara Residents with the monies being donated to local charities. This year, the event was extended to 5 days and offered a record 7,800 rooms at 27 Niagara Falls hotels including those on the Falls Avenue Resort. The monies collected this year will be distributed among 13 charities in the Niagara Region. In total, 43 charities have benefited from the support of Sleep Cheap. Niagara Falls, Ontario December 23, 2011 – Hard Rock Café, Niagara Falls, ON is kicking off the official season of giving by helping to feed children and their families worldwide. From December 26, 2011 through December 31, 2011 Hard Rock Café, Niagara Falls, ON will host Spin-to-win. The event will benefit WhyHunger, a nonprofit organization that strives to fight against hunger and poverty in America and around the world. Through a $1.00 donation guests will be able to Spin-to-win for chances to win great Hard Rock gear including dinner vouchers for the Café and Hard Rock Souvenirs. All guests who Spin-to-win will receive an IMAGINE there’s no hunger bracelet regardless so everyone is a winner. The event is part of Hard Rock International’s 2011 global IMAGINE THERE’S NO HUNGER campaign, which is supported by John Lennon’s wife, artist and musician Yoko Ono Lennon, to combat childhood hunger and poverty around the world. Dedicated to the brand’s “All is One” core value, proceeds from Hard Rock’s campaign will directly benefit WhyHunger, a leader in building the global movement to end hunger and poverty, and its grassroots partners around the globe in hopes of finding long-term solutions through sustainable agriculture. Hard Rock locations around the globe will also offer IMAGINE THERE’S NO HUNGER items in support of WhyHunger and its grassroots partners, which will be available for a limited time only, and exclusively at Hard Rock’s Rock Shops and www.hardrock.com. For more information or to show support for the campaign, visit www.HardRock.com or www.WhyHunger.org. For more information, please call Hard Rock Café, Niagara Falls, ON at 905-356-7625 or visit www.hardrock.com. WhyHunger is a leader in building the movement to end hunger and poverty by connecting people to nutritious, affordable food and by supporting grassroots solutions that inspire self-reliance and community empowerment. Founded in 1975 by the late Harry Chapin & current Executive Director Bill Ayres, WhyHunger works to put an end to hunger suffered by 49 million Americans and nearly 1 billion people worldwide. WhyHunger’s main programs include the National Hunger Hotline 1-866-3-HUNGRY, which refers individuals in need of emergency food assistance to soup kitchens, food banks, government nutrition programs & community organizations in their neighborhoods; the Grassroots Action Network, which provides information, networking opportunities, capacity building & access to over 8,000 anti-hunger & poverty community organizations across the United States and around the world; and Artists Against Hunger & Poverty which is supported by Bruce Springsteen, Michael McDonald, Chicago, Earth Wind & Fire, Joss Stone, Darryl McDaniels, Jackson Browne, O.A.R, and many others. For more information, visit www.whyhunger.org. With a total of 172 venues in 51 countries, including 135 cafes and 15 Hotels/Casinos, Hard Rock International is one of the world’s most globally recognized brands. Beginning with an Eric Clapton guitar, Hard Rock owns the world’s greatest collection of music memorabilia, which is displayed at its locations around the globe. Hard Rock is also known for its collectible fashion and music-related merchandise, Hard Rock Live performance venues and an award-winning website. In addition to the two flagship Seminole Hard Rock Hotels and Casinos in Tampa and Hollywood, Fla., Hard Rock Hotels/Casinos are located in Las Vegas, Biloxi, Orlando, Chicago, San Diego, Pattaya, Bali, Macau, Penang, Singapore and Punta Cana. Additional hotel and casino projects have been announced including Panama Megapolis, scheduled to open in 2011; and Hungary, Dubai and Abu Dhabi, scheduled to open in 2013. Hard Rock International is owned by Seminole Hard Rock Entertainment, Inc. For further details on Hard Rock Hotels and Casinos, visit www.hardrockhotels.com. For more information on Hard Rock International, visit www.hardrock.com. Traditional noisemakers will be replaced by an electronic techno beat as an indoor dance party featuring world-class DJs helps revelers ring in New Year’s Eve in Niagara Falls. Dubbed Golden New Year’s Eve 2012, the eight-hour dance fest will run from 8 p.m to 4 a.m. at the Scotiabank Convention Centre, featuring well-known DJs Avicii and Steve Aoki, Niagara’s own Christina Cruise and Manzone & Strong from Toronto. Unlike the free, family-oriented outdoor concert and festivities that will take place at Queen Victoria Park on New Year’s Eve, the DJ dance party is for people who are 19 years of age and older. Admission starts at $75. Featuring more than 1,200 rooms in three hotels connected to Canada’s largest one-stop entertainment complex, the Falls Avenue Resort has suites and packages to suit all visitors celebrating New Year’s Eve in Niagara. Make Falls Avenue Resort your destination of choice for the holidays! Reserve a Waterpark Holiday Package or Hotel Stay for arrival between December 24, 2011 and January 7, 2012 and receive $300 in Niagara Falls dining, show and attractions passes! Acknowledging National Breast Cancer Awareness Month (October) is the Hard Rock Cafe and Falls Avenue Resort itself. There will be a Human Ribbon Demonstration on the aptly named Rainbow Bridge on October 8th. Drop in and show your support.